Recipe submitted by Lisa Flournoy, writer, editorial department, Creative Studio, American Greetings. 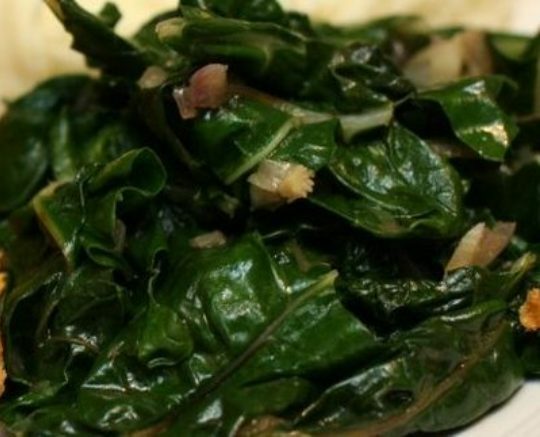 This recipe comes straight from Lisa’s mom, who loves to cook greens on Sunday. We think they’re a perfect addition to any table. Greens are loaded with calcium, iron and vitamins. Enjoy them anytime! Serve as a meal or side dish. Garnish with sliced tomatoes and chopped sweet onions. Thoroughly wash greens in cool water. Peel and cut turnip roots into quarters. Rinse and place smoked turkey, garlic, turnip roots and olive oil into a 5-quart pot, fill with water, cover and bring to a rapid boil for 15 minutes. Add turnip, kale and mustard greens to boiling water. Reduce to medium heat, cover and cook 1 hour. Add spinach, and cook for 15 minutes. Makes 4 servings per recipe. Prior to eating, some may prefer to discard the turkey tails.